Lovely converted barn available for self catered rental all year round with great onsite facilities, including swimming pool, tennis court, childrens play area, large gardens combined with with many local attractions to provide great days out. Flexible booking options outside the peak summer period allow you to chose what is best for you, whether you are looking for a longer holiday, a short weekend break, or a place to stay during the week on business, we would love to welcome you to stay with us. Click on the Book Now button for current availability and prices. Country kitchen with oven, hob, dishwasher, microwave, fridge (freezer in outbuilding next door) and washing machine. Breakfast bar with 2 chairs. Household supplies provided to make your stay as stress free and simple as possible, including tea towel, washing up liquid, dishwasher tablets, hand soap, kitchen towel, condiments (for stays over 1 week, an initial supply is provided). Large three seater sofa, single arm chair, further chair, coffee table, side tables, 42inch TV with sky package plus DVD player, DVDs, books and board games. Wood burning stove for those cosy nights in (supply of wood provided). 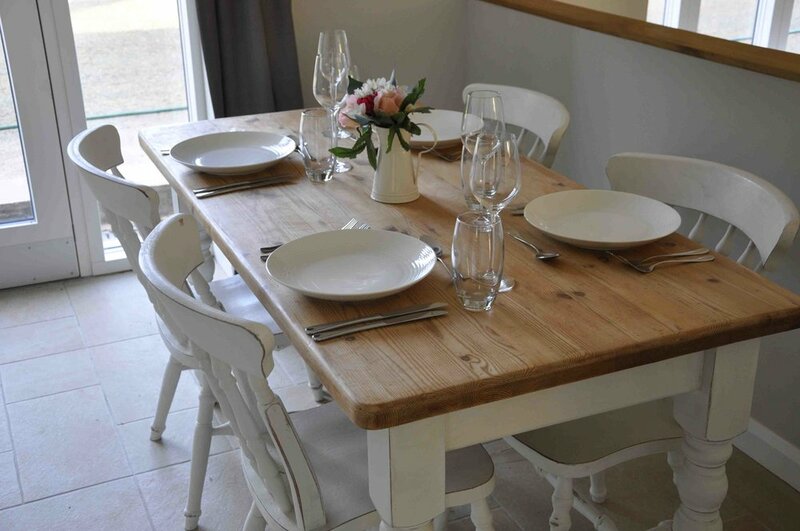 Dining table and 4 chairs (extra chairs and high chair can be provided on request). Comfortable king size double bedroom with wardrobe and chest of drawers. Travel cot can be provided on request (please choose this option during the booking process). Bright and airy twin bedroom, which can be configured as a super king on request. Wardrobe and chest of drawers. Bath with separate shower over, partially sunken into the floor for easy access. Hand towels, bath towels and pool towels (whilst pool is open) provided for each guest. Toiletries provided. Hot water available on demand, supplied by our centralised biomass heating system. Salt water chlorinated swimming pool heated by our biomass boiler. Open May through to September (shared use). Available all year round, tennis racquets and balls provided or bring your own. Please note that Cherry Tree Barn is pet free accommodation and no smoking is permitted inside the barn.